Based on a STM32F103TBU and a MPU9150 he can be controlled - equipped with a Deltang RX31 - with DSM2 compatible transmitters - equipped with a Bluetooth module SPBT2632C2A.AT2 - by smartphone/tablet or by infrared. 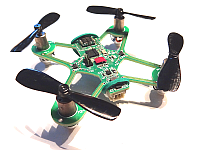 He can drive small brushed motors directly or small brushless motors using external ESC's. He can recognize himself which motor type and which receiver is equipped. After the last years my job and hobby have overlapped several times or private stuff was over-taken by the job, I was looking for a new private hobby project - thematically far from the Job. 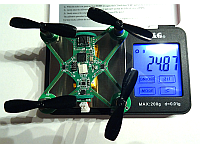 Inspired by two acquired RTF models (ready-to-fly) and the many different projects on the Internet (see links below) attracted me to build an own very small quadrocopter providing that all software developing myself in order to understand what, why, how does. I was clear that - although I once studied automation / control technology many years ago - it would be going a long and rocky road. So just build, load into someone else's code and fly away is it and should it not be even. 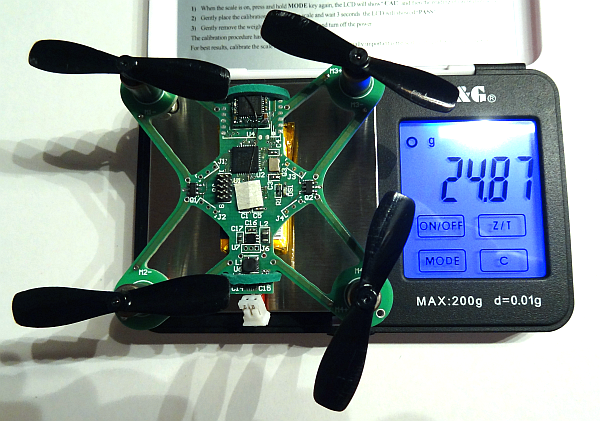 And so I collected first ideas for my "picoQuadcopter". 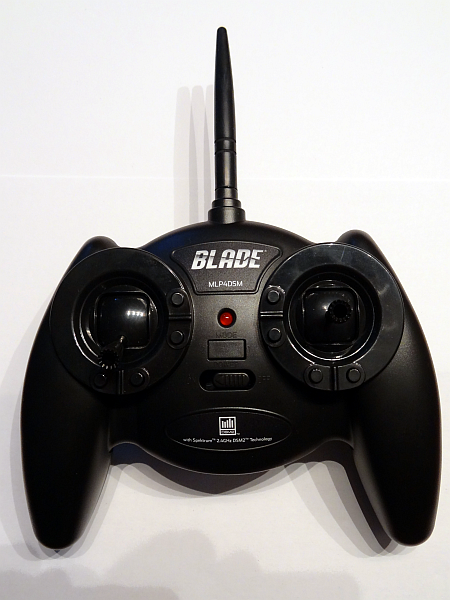 As remote control in any case at first a default variant in the model flight world should work, so no PC adapter or gamepad with middleware. As I remembered DSM2 as a de facto standard. And the Deltang there is also a great fit to small and lightweight receiver RX31. 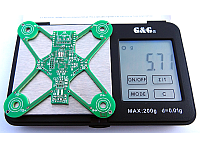 And in the Internet, there are in addition to the Spektrum DSM transmitters also inexpensive alternatives, one of which I got the same one - the Blade MLP4DSM. However, the use of Android tempted me again and so I found a great little Bluetooth SPP module from STM, the SPBT2632C2A.AT2, whose procurement but made some difficulties. In addition, the installation of a very small 5.8GHz camera TE60A and the power supply was provided. This should have better picture quality Youtube than the alternative CM205. 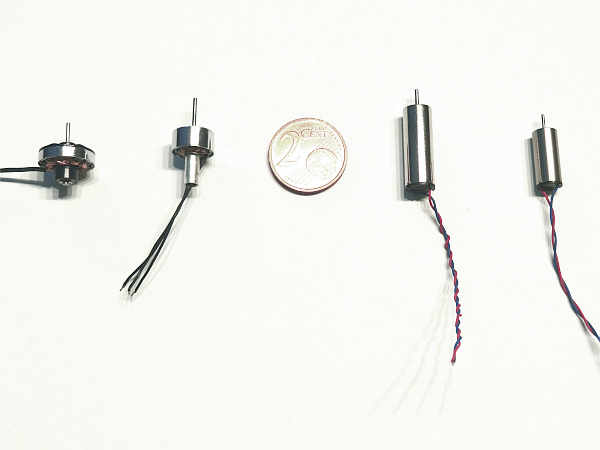 As motors fot the startup normal coreless brushed motors was planed. 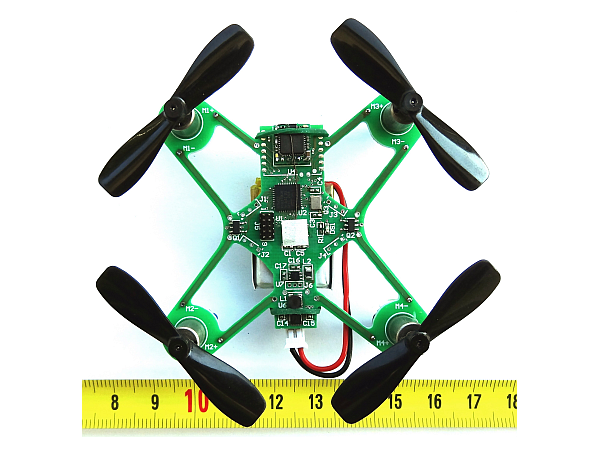 However, the use of very small brushless motors using ESC mini-modules should be included with the same style. And so the X-Twin (Silverlit), Hubsan/Ladybird, Hextronik 2g und HP02T were planed at first. 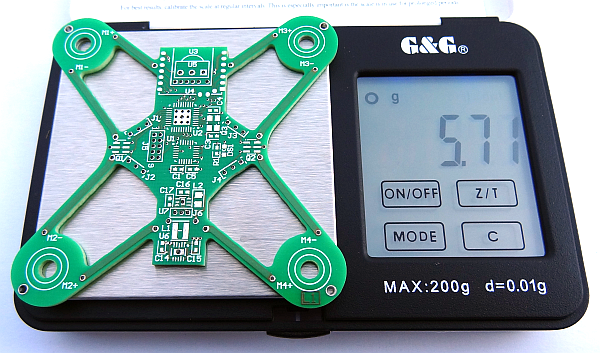 Maybe later the AP02 could also be used if they can be fit well ... 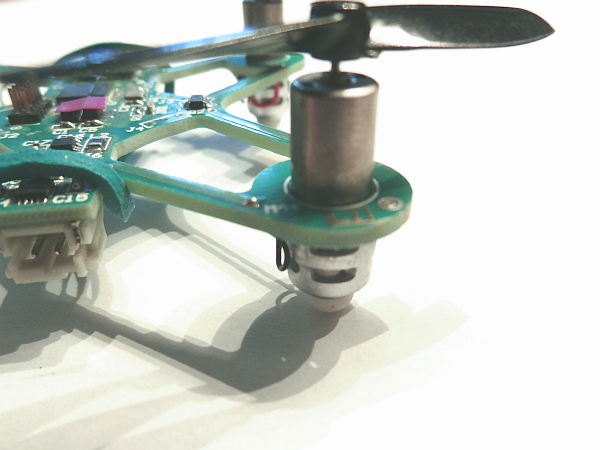 But the mounting of the motors should be kept as simple as possible. 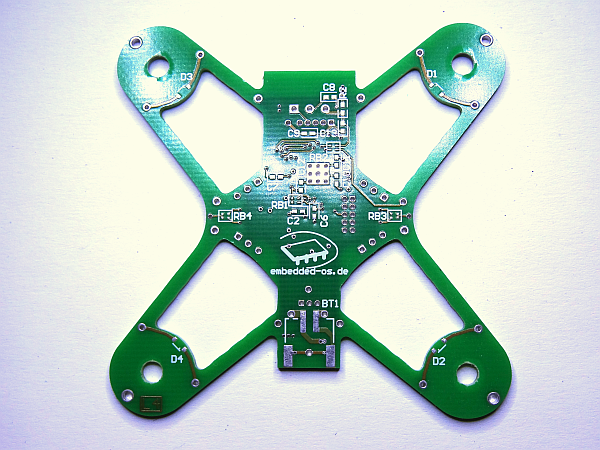 Inspired by other projects the picoQuadcopter should be constructed as a pcb-flyer and the motors are mounted directly (edit: I thought the vibration was not yet). Based on many years of my good experience with ARM processors I chose the STM32. 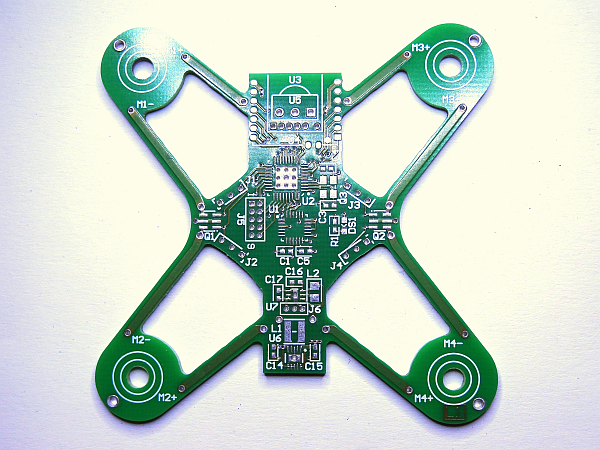 It provides all the necessary interfaces and that in a very compact design VFQFN 36 (STM32F103TBU). The first building was of course to allow a quick start of the software development: So Hubsan coreless brushed motors + RX31 DSM2 receiver. And of course we went straight to the scale. 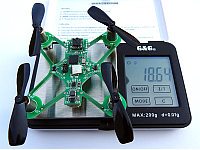 So the development of software for the picoQuadcopter was started. After the system init, the PWM outputs for the motors, the I2C communication with the sensor MPU9150 and UART communication with the RX31 were placed, a first very simple PID control has been set up and tested. 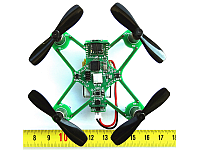 Parallel to this other buildup's with damping motors mount, brushless motors, Bluetooth and FPV will created... (see second versions & FPV).